When it comes to sledge hockey goaltending, size matters, says Paul Rosen, who played goal for Team Canada at the 2002, 2006 and 2010 Paralympic Games. Russian sledge hockey player Mikhail Ivanov never wanted to be a goalie, but that didn’t put a stop to him becoming one. Switching over to sledge hockey after losing his leg in an accident, Ivanov’s massive upper body size had him positioned to man the crease from the get-go. 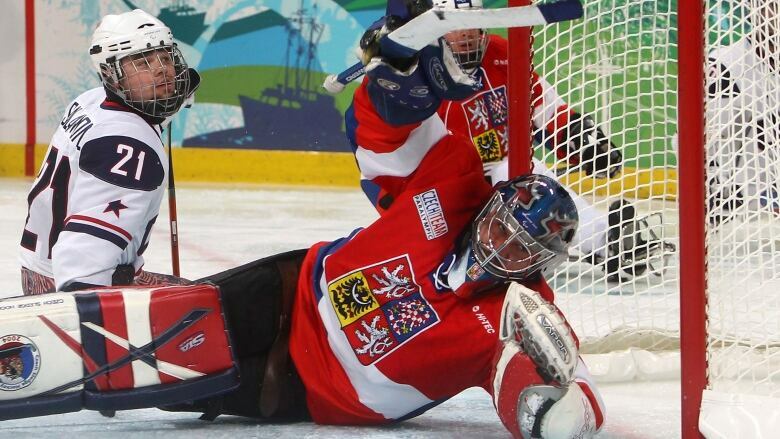 Take a look at the sledge hockey goalies in these Paralympics. Many of the goalies have size and height. Ivanov and Norway’s KristianBuen are both six feet two inches tall, while the Czech Republic’s MichalVapenka is six feet four inches. ​Perhaps natural ability, positioning and quickness can be argued to set aside the best from the rest, but for most it’s the size that matters. “If you see the goalies now like the Czech Republic’s, Italian and Korean goalies even the Russians, they’re all extremely big,” said Paul Rosen, a former Canadian sledge hockey goalie and a Paralympic gold medallist. “They might not be able to move as well but they cover a ton of the net. In Canada’s opening game versus Sweden the size difference in net played a factor. The Canadians used the opportunity to shoot the puck high and as a result managed to score 10 goals. Size also played a major factor in Canada’s game against the Czech Republic on Tuesday. Canada outshot the Czechs 19 to seven, but the hulking Vapenka blocked all but one. But BenoitSt-Amand,a back-up goalie in Sochi for Team Canada, says technique is what matters most. At five feet 10 inches, St-Amand isn't the largest of goalies, but he doesn't think "body size makes a big difference." “We have smaller goalies like Steve Cash of the United States, for example," St-Amand said Tuesday, referring to the five-foot seven-inch star goalie for Team USA. "The key factor is technique. ​Rosen, who was Canada’s goalie in the 2002, 2006 and 2010 Paralympic Games, is a taller six feet. He believes height helps for sledge hockey goalies, but did mention one thing that trumps all. “The best sledge hockey goalie is a goalie that played able-bodied and became disabled, so they have the skill of a goalie to begin with,” Rosen, said. For Ivanov, net might not have been his first choice, but it turns out he’s quite good. He helped the Russian team to a bronze medal at the 2013 World Championships and was named goaltender of the tournament after blocking 55 pucks. Funny thing, though: even if Ivanov were to become the best sledge hockey goalie of all time he’d still rather be shooting pucks than stopping them. “I asked to come out into the field but they told me, ‘You’re good in the net. Stay in the net.'"